Quick overview: An ESL/Literacy website that contains typical English dialogues (going to the doctor, shopping, taking a taxi, etc..) that your students may encounter in their everyday life. Each sentence or individual word can be spoken out loud with the click of a mouse. 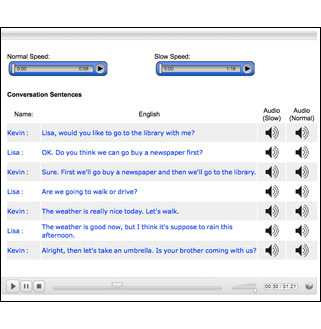 Students can choose hear the audio clips at a regular or slow speed. How can this be used in the classroom? Englishspeak could be used by ESL/Literacy students who need help with learning basic vocabulary and pronunciation. It’s also useful for students who benefit from learning at their own pace. As this resource is web based, your students can visit this website on their home computer or a school computer (with earphones) and listen to material as many times as they want. This entry was posted in Tools and Apps and tagged earphones, english speak, englishspeak, esl, headphones, listening activity, Literacy, speak, spoken. Bookmark the permalink.